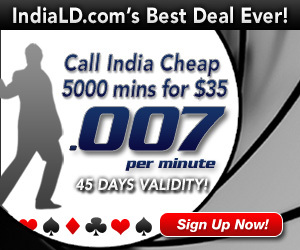 IndiaLD : India Calling card : Call India for 0.7Cents/minute | Free Pc to Phone Calls, Free Voip Calls to India International ! This holiday season with Christmas and new year around, we assure you that you will not spend much on your phone calls. Thanks to the latest new year promotions and offers by various voip providers offering cheap and free voip calls. Yesterday we posted about Pingo Calling cards which is offering very cheap calls to India clubbed with some great offers (offering effective rate of less than one cent). Today we will discuss another such offer by well known IndiaLD. Already very popular IndiaLD is celebrating its 1st anniversary with some very good promotions to call India. Lets talk about these promotions and benifits in details. According to me, if you are from USA and making a lot of calls to India then $35 plan is good for you. It is not for the people who make less call to India and are not sure that they will be able to consume 5000 minutes in 45 days. Pay as you go plan is good by IndiaLD, the calling rate to India is very competitive. I guess Pingo Calling card is equally good or a better option for those who want to make calls to India. So I would suggest you to check both and then make a choice.